There are few things more comforting and delicious that a really good macaroni and cheese. Annie's (in the orange box) is my standby. I'm not sure I would have survived college without it. But when I want something a little heartier and even more delicious, I turn to my mother's tried and true recipe, which I think she made about every other night for a few years in there when I refused to eat anything else (those were about years four, five, and six). My mother's recipe starts with a traditional (and easy to remember) 1:1:1 roux (that's 1 tablespoon of butter, 1 tablespoon of flour, one cup of milk). But the recipe below is not my mother's mac and cheese. Sorry mom. I have found something better. Something more indulgent. Something that involves caramelized onions. The recipe below if also endlessly customizable. You can swap out all or part of the cheddar for any other kind of cheese. You can change the spices. You can skip the bread crumbs. You could add the cheese directly the roux, let it melt, and then serve over the pasta without baking. You can add sausage (fake or real). You probably can't magically transform this into something low fat and low carb. There is no way around it. This is an extremely indulgent dinner. My favorite kind! I served it with sautéed broccoli. To counteract the richness of the macaroni and cheese, I went with a salty and a bit spicy. Chop the broccoli. Heat up a skillet with two tablespoons of olive oil and a few drops of sesame oil. Add the broccoli, a few teaspoons of soy sauce, and a generous dash of spicy red pepper flakes. Toss to coat, put on the lid and cook for a few minutes, just until the broccoli just begins to soften. I think it's best al dente. 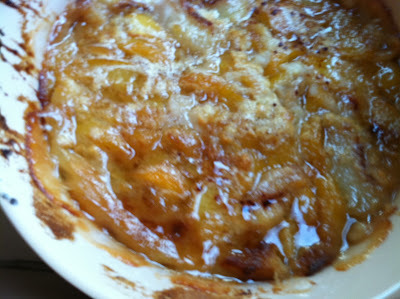 It wouldn't have occurred to me to write about the macaroni and cheese here, since, you know, it is not dessert, but my friends who came over for dinner the night I made this pointed out that it had also come from the evening oven. So there you have it, Franklin and Madison (who was one of those dinner guests) have boldly entered the world of savory baking. More to come. Sweetness Factor: 1; Indulgence Factor: 9; Difficulty Factor: 4; Chance We'd Make it Again: 11. Thinly slice the onions and put them in a saute pan over medium-low heat (without oil). Let them saute, stirring occasionally, for about five minutes, until they start wilt and look more translucent. Add a tablespoon or two of olive oil, lower the heat, put a lid on, and let them go, stirring occasionally to make sure they aren't burning, and adding a little bit of water if they are starting to stick to the bottom of the pan, for about a half hour. They should turn out translucent, soft, sweet, and delicious. While the onions are cooking, make your pasta per package instructions. While the water is boiling, grate the cheese, destem the rosemary and dice it, and butter and toast the bread. 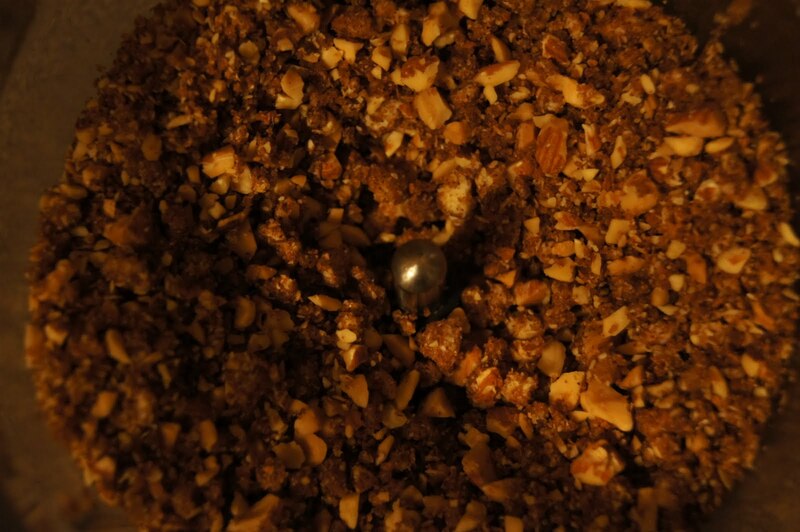 Once the bread is toasted, turn it into bread crumbs with a cuisinart (you could also just dice it). Once the pasta is on, preheat the oven to 350 and start the roux. Melt the butter in a small saucepan over low heat. Add the flour and stir until dissolved. Heat up the milk in a separate saucepan, or in the microwave, and then add it to the butter flour mixture, whisking the whole time. 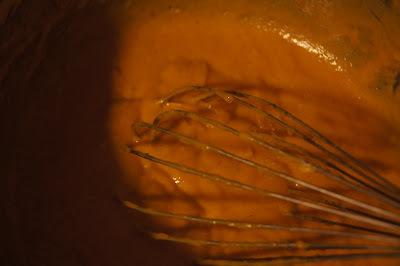 Turn up the heat to medium and continue to whisk until the mixture starts to thicken and begins to boil (don't let it come to a rolling boil). This should take about five minutes, if it is taking too much longer, try turning up the heat. Once the sauce is thick, turn the heat down to low and add all the spices (the rosemary, red pepper, and mustard powder). Lightly butter a 2.5-3 quart casserole dish. The pasta should be done by now, drain it. Add the ingredients to the casserole dish in layers. Pasta first, then roux, then cheese. Repeat. Repeat. Spread the bread crumbs out on top, and the grate a little bit of parmesan over the top. Bake for about 25 minutes until it starts to brown on top and the cheese looks melty! At this time of year (really my favorite time of year), I can't get enough pumpkin. Pumpkin pie. 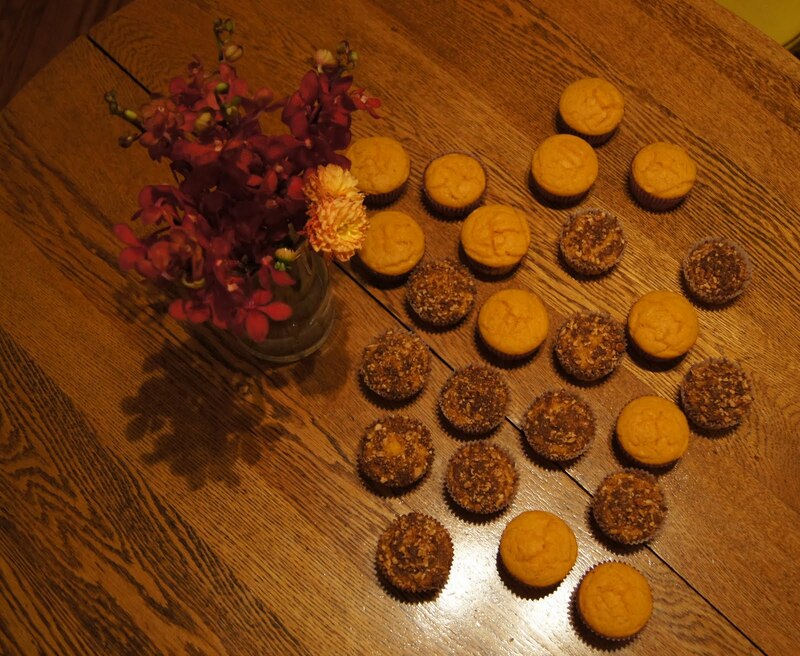 Pumpkin cookies. Pumpkin soup. Pumpkin stir fry (yup, that's what I'm having for dinner tonight, pumpkin stir fried with onions and ginger on a bed of quinoa and topped with roasted cauliflower). Candy shaped like pumpkin is good too. Also, I'm a fan of pumpkin for breakfast. Conveniently, my office needed breakfast for a meeting, so I volunteered to bake. Torn between pumpkin muffins and pumpkin coffee cake, I decided to go for an amalgamation of the two: pumpkin muffins with just a thin streusel topping. Not so overwhelmingly sweet as coffee cake, but sugar enough to get the day off to a good start! The pumpkin muffin recipe is taken mostly from Smitten Kitchen, and, if you haven't already, I recommend getting on board with Deb's muffin philosophy: no more than two bowls, no mixer needed, not to heavy. And, obviously, delicious! 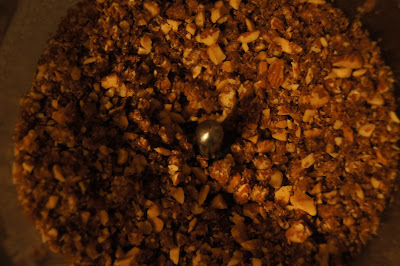 For the streusel, I went for a simple brown sugar, almond, cinnamon mix with just a few tablespoons of butter. It formed a thin crunchy crust on the top of the muffins. Next time, I think I might add a few tablespoons of flour and a a few more tablespoons of butter for slightly more substantial topping, but they were quite nice as is. I made one batch without streusel and one with. Turned out to be an easy way to give my coworkers choice without really adding any work for me! The recipe made about 2.5 dozen muffins, so it was it a good thing that they keep quite well! Enjoy! And if you have any creative pumpkin recipes, please send them my way! Sweetness Factor: 4; Indulgence Factor: 4; Difficulty Factor: 2; Chance We'd Make it Again: 7. 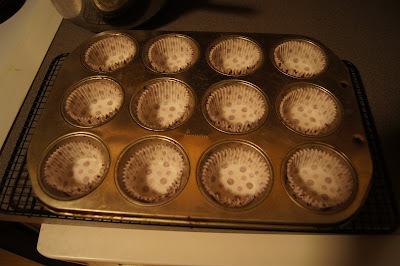 Preheat the oven to 350 and put liners in a muffin tin (you could also just butter the tin, but liners are easier, especially if you are going to do more than one batch). Combine all the muffin ingredients in a bowl, one at time, whisking to combine after each. 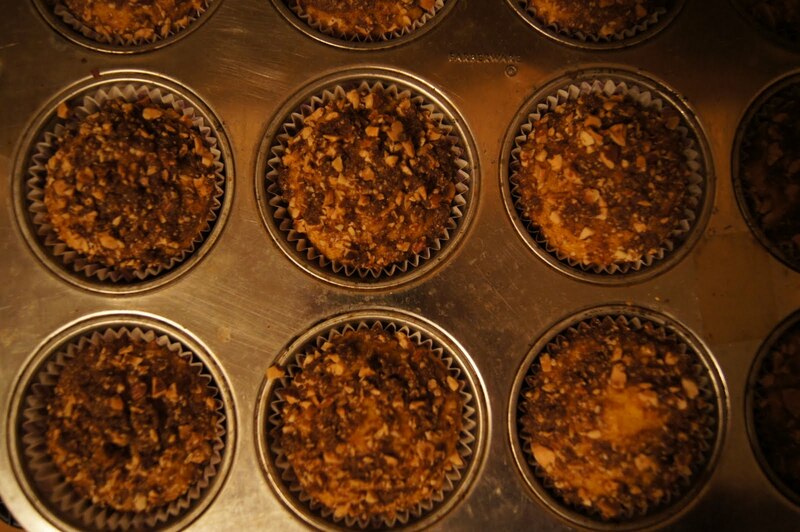 Fill each muffin liner about 2/3 full. 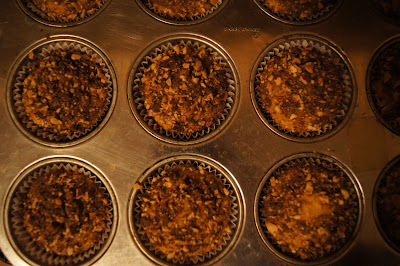 Bake for 20-25 minutes, until muffins bounce back when pressed lightly. Cool for a few minutes in the tin, and then pull the muffins out (either foolishly with your fingers, like I did, or dump the whole tray upside down). Allow muffins to cool completely before storing. While the first batch is baking, make the streusel. Combine the cinnamon, almonds, and brown sugar in a cuisinart and blend thoroughly (more or less depending on how much crunch you want), add the butter and pulse until butter is in small but still visible bits. For the rest of the batches of muffins, spread about a tablespoon of streusel over the batter of each muffin before baking. Now, I know it isn't really peach season anymore (sorry, I'm a procrastinator), but because you cook the peaches, I think this would be almost as good with frozen peaches, and having it now (or even in the winter) would be a nice way to bring back a little taste of summer. I would definitely serve this with vanilla ice cream, or maybe some of the home made stuff Franklin has graciously taught us all how to make! You can keep leftovers in the fridge. I warmed them up for about 5 minutes in a 300 degree oven the next night, and they were still delicious. In a pot on the stove over medium heat, put all of the peaches and one cup of the sugar, plus all of the water. Once the mixture has started to boil, simmer for an additional 10 minutes, stirring occasionally. While the peaches are simmering, put the butter in your baking dish. (The dish should hold at least 3 quarts, though I'd go with a 4 quart dish to be safe.) Put the baking dish in your heating oven, so that the butter will melt. As the butter is melting and the peaches are simmering, mix together the other cup of sugar and the flour, baking powder, salt and milk. (Look at you multitasking!). Once your butter has melted, take the dish out of the oven. Pour in the sugar/flour mix. Pour the peaches on top. If you like cinnamon, sprinkle all over the top. (It makes for a pretty finish, too!) Put the dish back in the oven, and bake for about 35 minutes. The dough will rise through to surface and start to turn golden brown. Remove from the oven, let cool slightly (or all the way to room temperature if you like), and serve. Despite having a full Saturday afternoon's worth of work to do, when I started thinking about the dinner party for which I had promised to make dessert, I felt compelled to embark on a serious project. Well, perhaps it was because I had a Saturday afternoon's worth of work to procrastinate on. I decided to it was high time I try to make a pastry crust: a rustic tart would be just the place to start. The final product was well-received, but the process was replete with one near disaster after another. All the product, at least in part, of deciding not to follow a single recipe from start to finish. I began with Mark Bittman's How to Cook Everything Vegetarian, which is one of my all-time favorite cookbooks, and a good go-to for skill building in the kitchen. His section of tarts and pies was full of useful information: illustrations to guide rolling, diagrams to direct shaping the dough, and (what would be my near downfall) an informative section on pre-baking. 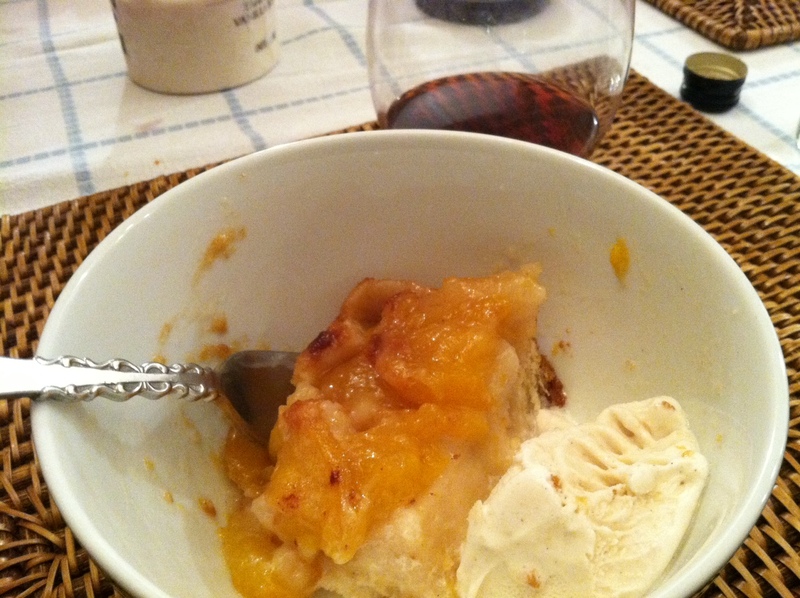 The second recipe I moved on to was from Smitten Kitchen. This tart was of the more rustic variety. The rough edges of the dough were folded over the fruit, and it looked delicious. That was what I wanted mine to look like. But that tidbit on pre-baking stuck with me. That was something it seemed like one did with pie crust. So I whipped up some dough, following Mark Bittman's recipe, rolled it into a ball, chilled it, rolled it out flat, shaped it into a tart pan, chilled it some more, and then, foolishly, covered it with a piece of buttered tinfoil weighed down with dried kidney beans. Why? Because Mark told me to. After sliding it confidently into the oven, it occurred to me that if I pre-baked the dough for the full twelve minutes Mark suggested, I wouldn't be able to fold the dough over the edges of the fruit. As a compromise, I thought, "I'll just bake it for five minute." Genius. Of course, after five minutes, a dough full of butter becomes a dough full of melted butter. To make matters worse, my recycled whole food aluminum ripped when I tried to move it and then I had to pick kidney beans out of the soggy dough. Eh, it is still flour and butter, so I think I'll just keep going. I piled in the fruit, and put it back in the oven. Back on track. Except. After twenty-minutes the kitchen started to filled with smoke. The tart pan had one of those removable bottoms and some excess butter was pooling on the floor of the oven and burning. I had followed the instruction to place the tart pan on a cookie sheet, but I had picked one with no rim! Now I had a kitchen full of smoke and a half-done tart, so I did what any one would do who didn't want to give up on a such a serious investment of baking time. I pulled the tart out of the oven, put on two oven mitts and used them to sop up as much of the burning butter as possible. This worked relatively well (although, let me just say, in case you ever find yourself in this situation, don't put those oven mitts in the washing machine with your sheets). Back on track. The final product was a bit buttery. The crust didn't have that nice flake to it. But it was a tart. And it was eaten. The recipe below will, I am almost certain, produce much better results that I achieved. While all of this was going on, I was also making maple almond milk ice cream. This was much less eventful. It thickened like it was supposed to. It froze like it was supposed to. It tasted sweet and mapley. Sweetness Factor: 4; Indulgence Factor: 7; Difficulty Factor: 8; Chance I'll Make it Again: 8. 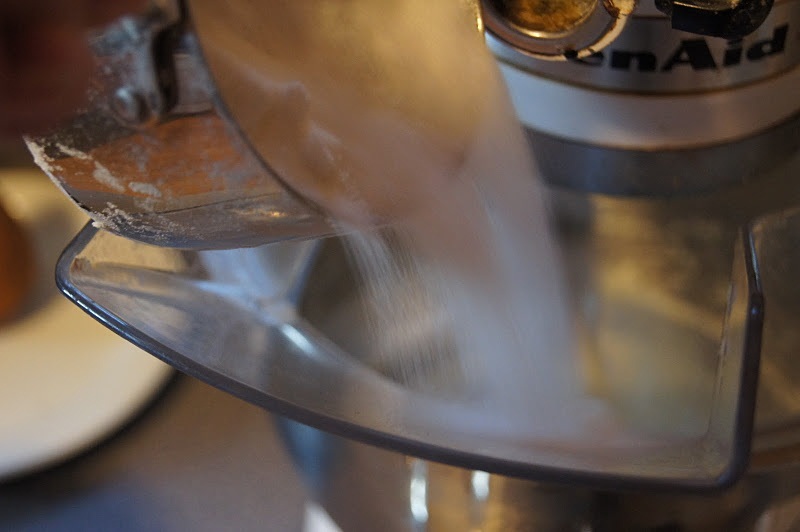 Combine flour, salt, and sugar in a cuisinart. Add the butter all at once and pulse 10-15 times until it looks like a very coarse meal. There should still be lots of visible bits of butter. Add the egg yolk and pulse a few more times. Dump the dough into a bowl and add the water. Mix with your hands until the dough will form a ball. Wrap the ball in plastic and chill about fifteen minutes. Roll out the dough between two sheets of plastic until it is a few inches larger (all the way around) than your tart pan. Press the dough into the pan, push gently into the corners. Cover with one of the pieces of plastic and freeze for about a half hour (or refrigerate for an hour). You could also leave it in the refrigerator over night. In the meantime, peal, core, and slice up the fruit. Unless you want to do neat rows of apples and pears there is no reason not to mix it all together. I meant to do neat rows, but ended up going for a jumble because who wants a slice that has only one or the other! Preheat the oven to 425. Arrange the fruit in dough. That's right. Don't prebake it. Pull the extra edges over the fruit, pinching occasionally to make it look professional. Sprinkle the sugar over the top and brush the dough with a little of egg white. You could also brush with cream or melted butter. You may also want to brush the fruit with melted butter, but I think that step is optional. Bake about 45 minutes (set on top of a rimmed cookie sheet) until the dough is golden and the fruit is bubbling. Let it cool on a rack for about ten minutes before removing the edge of the tart pan. If you're feeling brave you can also slide the tart off the bottom of the tart pan and on to a plate once it has totally cooled. Serve with maple almond milk ice cream! Sweetness Factor: 8; Indulgence Factor: 6; Difficulty Factor: 6; Chance I'll Make it Again: 10. Combine the almond milk, syrup, and butter in a saucepan over medium heat. Stir occasionally until butter melts and mixture is on the verge of a boil. Dissolve the cornstarch in the hot water. Add it to the butter/milk/syrup mixture. Whisk regularly (make sure to get into those corners!) until the mixture begins to thicken. It should start to get thick by the time it starts to boil. It is done when it can coat the back of a spoon. Pour it off into another bowl, set in an ice bath. Once it has cooled a bit, put it in the refrigerator and let it cool COMPLETELY. Once it has cooled COMPLETELY, churn in ice cream maker per ice cream maker instructions. Put it the freezer for at least an hour before serving (or just eat it straight from the ice cream maker while no one is looking). I guess this has been a layer cake sort of week for me. Yesterday I had to make a dessert for the inaugural meeting of a new book club, and I wanted to try something new. Nothing on my usual websites was speaking to me, so I tried something I haven't done in a while. I went to the cookbook shelf and started flipping through books. After aimlessly flipping through several, I realized I was wasting time by not going straight to the source. The one, the only: Maida Heatter. Her Book of Great Desserts has been seminal in my baking life. She has provided me not only with my birthday cake (Chocolate Pound Cake, haven't missed a year, more on that in a few weeks) but also with several other of my most favoritest recipes: Moosehead Gingerbread, Queen Mother Cake, East 62nd Street Lemon Cake, to name a few. 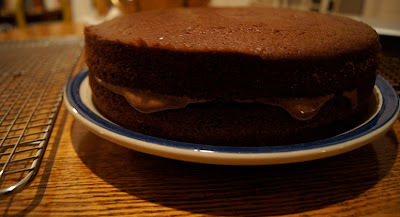 I decided to try the sour cream chocolate cake, which I had never made. Having no sour cream, and not wanting to go to the store, I substituted plain yogurt. A number of websites suggested I could just do a one to one substitution. Several suggested adding some baking soda. The general consensus was that I should strain the yogurt using cheesecloth, in order to make it thicker. Having no cheesecloth, I decided to compensate by adding a bit of extra flour (in the cake batter) and cocoa powder (in the frosting). 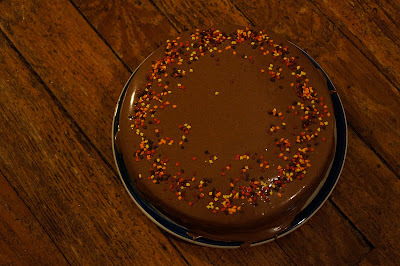 This approach worked fine for the cake batter, but the frosting was a bit runny, and, by the time I got to my destination, a lot of the fall leaf sprinkles and had used to decorate were running down the sides. The frosting did eventually set, but I think if I make this again, I would either take the time to strain or start with Greek yogurt. This is a very moist and slightly tart chocolate cake. It doesn't need ice cream. I had my slice with a nice glass of rye, and that was basically dinner. One bit of advice, in case you decide to pick up your own copy of the Book of Great Desserts, I have consistently found that the baking times are WAY too long. This case, for instance, called for 35 minutes, and 25 was sufficient. I like to the think that Maida just had a really cool oven when she was working on this book. Adjust oven rack to two-thirds from the bottom, and preheat the oven to 375. Prepare two nine inch round baking pans. I use baker' joy, so I don't prepare them until the batter is done, but if you are going to go the traditional butter/flour route, do this first. I also used my magi-cake strips, which help the cake bake level. They need to go in the oven soaked, so it is best to do that once the batter is ready. 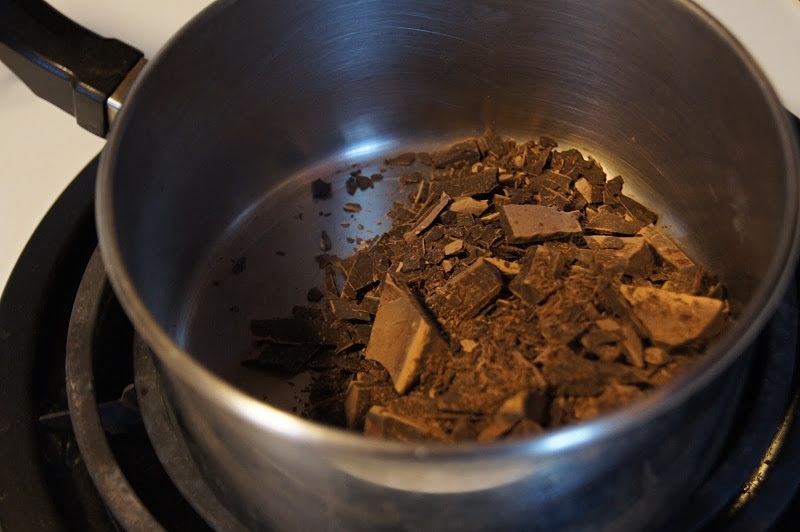 Chop up the chocolate and put it in a small saucepan over low heat. Pour the boiling water over it and stir until the chocolate is melted. Set aside to cool. In a small bowl, combine the dry ingredients (flour, baking powder, baking soda, and salt) and set aside. In an electric mixer, cream the butter, and add the vanilla and sugars. Beat until well combined. Add the eggs one at time. Measure out the yogurt and add the tablespoon of flour to it. 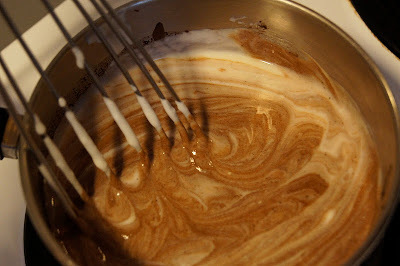 Whisk the yogurt together with the melted chocolate and slowly add to the butter/sugar mix. Beat until just combined. Scrape down the sides. On the lowest speed, add the flour mix and beat until nearly combined. Finsihing combining by hand. Divide the batter evenly into your pans. The batter is pretty thick, so you'll need to give the pan a good shake and some taps on the counter to spread it out evenly across the pan. If you are using magi-cake strips, put them on now, and get the batter level. If you aren't, you might want to spread out the batter so it is slightly lower in the center. Bake for about 25 minutes until the top springs back and the cake is pulling away from the sides. Let cool in pans for 5 minutes and then turn the cakes out onto cooling racks. Cool completely before frosting. To make the frosting. Melt the chocolate and butter in a double boiler and let cool completely. In an electric mixer, combine the yogurt, vanilla, and salt. Add the chocolate mixture. On the lowest speed, add the sugar. Once the sugar is combined, turn the speed up to whip the frosting. I let it go about two minutes. Frost! Maida recommends using wax paper strips, cut into short lengths, and tucked under the cake, so you don't get any frosting on the plate. I usually skip this step, but it is nice if you are going for a fancier presentation. Start by placing the bottom layer on your cake plate. I like to use this step for leveling: I use a slightly rounded plate, and put the rounder cake facedown, leaving a level side up. put about 1/3 of the frosting on the center, and spread it around evenly. Place on the top layer. Spread frosting around the sides first, and then over the top. Add your favorite sprinkles. Enjoy! I came home from work the other day quite late and feeling rather sorry for myself. I was too tired to make a proper dinner or to make the molasses chew cookies I'd been thinking about for days, but I really wanted something decadent and easy to make. I wandered into the kitchen and stood a bit hopelessly in the middle of the room looking around at my options. And there it was. My enormous store of jiffy box mixes! 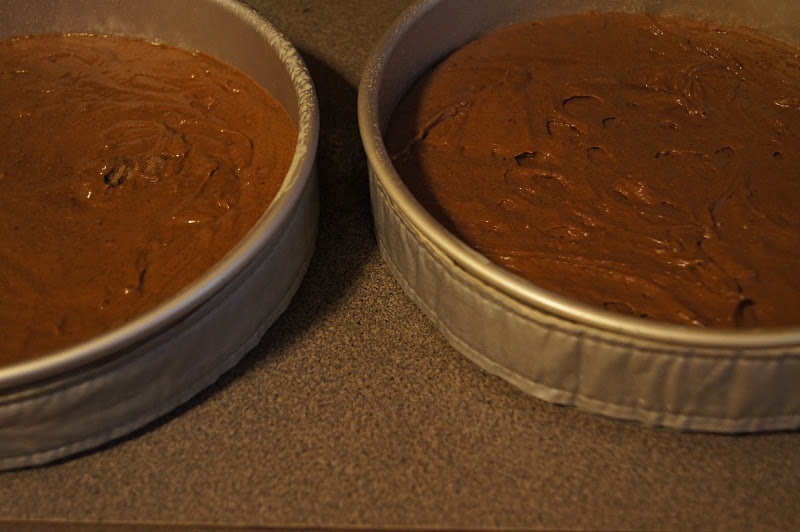 sometimes has more baking soda than other cakes, giving it a darker color. 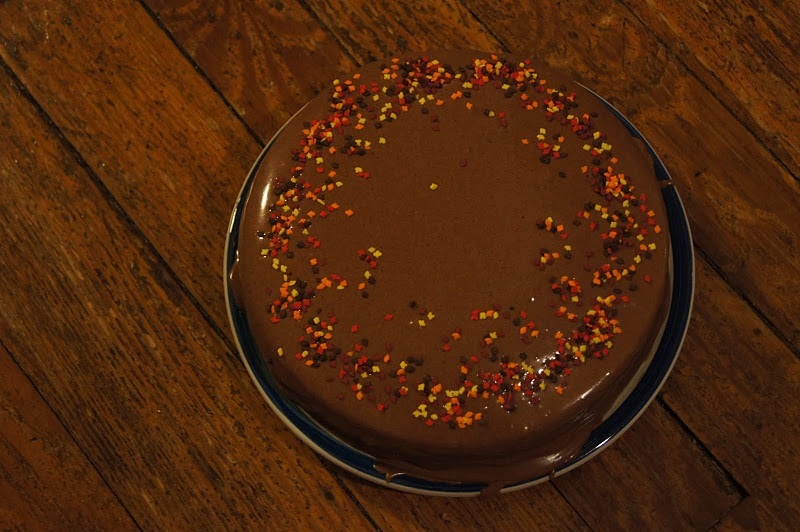 Rose Levy Beranbaum describes her Triple Layer Devil's Food Cake as "a moist, fine-textured, intensely chocolate cake." So there you have it. It is chocolate layer cake. On to the main event. In my first Jiffy experiment, I learned that the mixes are extremely sweet. I also learned that the portions are relatively small. So I decided to increase the portion side and cut the sweetness of both mixes by adding extra flour and some plain yogurt. And, because why not, some dark chocolate chips. I briefly considered making my own frosting, but ditched that plan when I realized I had four boxes of the fudge frosting mix I would eventually need to go through. I added a bit of maple syrup to the frosting. I figured there was no saving it from being too sweet, I might as well add a little nuance to the sweetness. The result was really quite good. Both cake boxes direct beating the batter for several minutes with a hand mixer, so the texture of the cake is almost like angel food cake. The cake was sweet, but not disgustingly so. The chocolate bits mostly fell to the bottom in both cakes, and I stacked then chocolate-bits sides together, so there was a nice texture dark chocolate layer between the two cakes. I probably won't make it again, but only because I only had one box of the devil's food mix, and I've never seen it at a super market on the east coast. Sweetness Factor: 9; Difficulty Factor: 1; Indulgence Factor: 8; Chance I'll Make it Again: 4. Preheat the oven to 350. Grease to 9" round cake pans (you can also use 8" rounds, but you will need to increase the baking time by about 5 minutes). Empty each mix into a separate bowl. Add the half of the next four ingredients (eggs, water, flour, yogurt) to each bowl. Stir to combine. Then, using a hand mixer, beat contents of each bowl (separately) for about three minutes. You could also use a whisk or the whisk attachment to the kitchenaid. Add half the chocolate bits to each bowl. Empty batter into the prepared pans. Bake for about 20 minutes until cake starts to pull away from the sides and the top bounces back when pressed lightly. Let cool for about 10 minutes before removing from pans. In the meantime, empty the fudge mix, water, and syrup into a bowl and beat with hand mixer until smooth. You can add extra water into if you want to thin it out. Jiffy recommends using two boxes of mix to frost this amount of cake, but I found one was sufficient if you spread it thinly. Sprinkle with your favorite decorative sugar, and enjoy!